Coal is different from oil and gas, in that it is more of a “drill it as you need it” fuel. In many parts of the world, coal mines have a high ratio of human labor to capital investment. If prices are high enough, coal will be extracted and consumed. If prices are not sufficiently high, coal will be left in the ground and the workers laid off. According to the BP Statistical Review of World Energy 2018, coal prices in 2017 were higher than prices in both 2015 and 2016 in all seven markets for which they provide indications. Typically, prices in 2017 were more than 25% higher than those for 2015 and 2016. China is one country whose coal production has recently ticked upward in response to higher coal prices. Its overall energy production pattern still appears worrying, however. Figure 4. 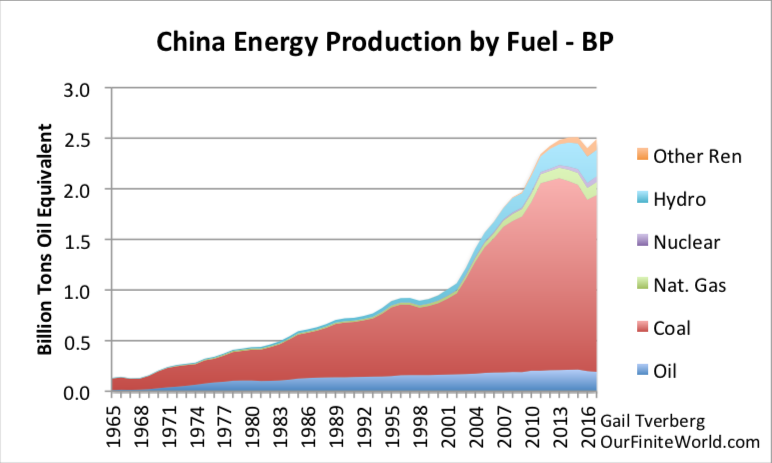 China's energy production by fuel, based on BP Statistical Review of World Energy 2018 data. China has been able to bridge the gap by using an increasing amount of imported fuels. In fact, according to BP, China was the world's largest importer of oil and coal in 2017. It was second only to Japan in the quantity of imported natural gas. Figure 5. 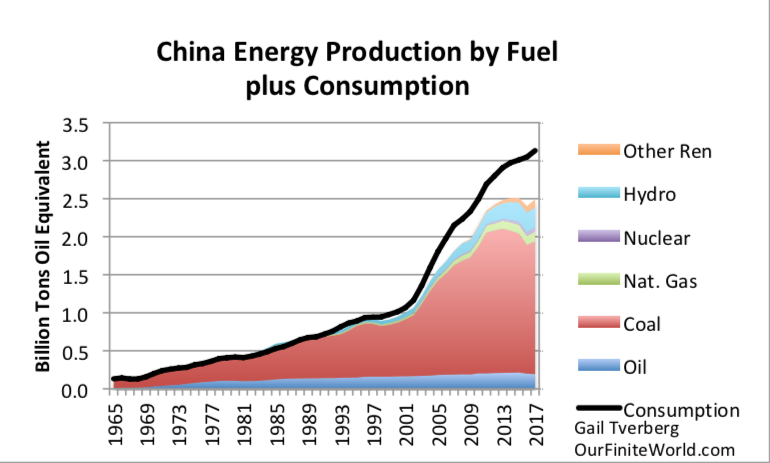 China's energy production by fuel plus its total energy consumption, based on BP Statistical Review of World Energy 2018 data. Figure 6. 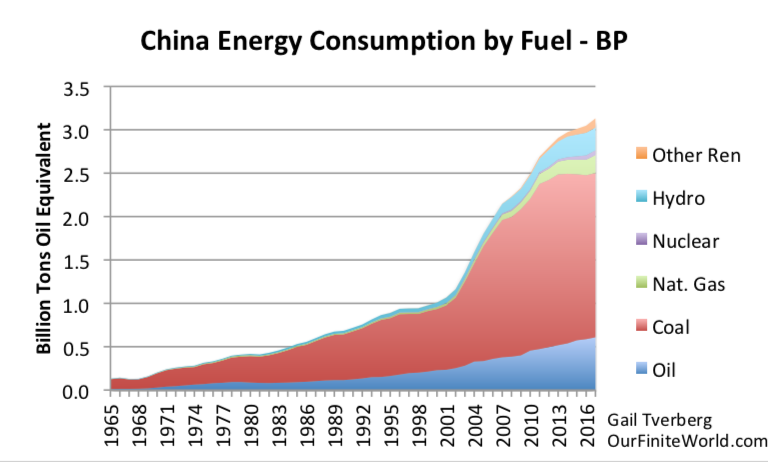 China's energy consumption by fuel, based on BP Statistical Review of World Energy 2018. India, like China, seems to be a country whose energy production is falling far behind what is needed to support planned economic growth. In fact, as a percentage, its energy imports are greater than China's, and the gap is widening each year. 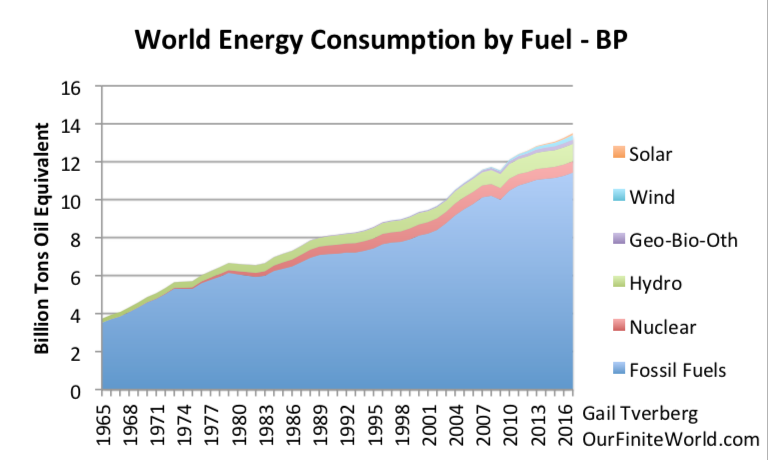 The big gap between energy production and consumption would not be a problem if India could afford to buy these imported fuels, and if it could use these imported fuels to make exports that it could profitably sell to the export market. Unfortunately, this doesn't seem to be the case. Figure 7. 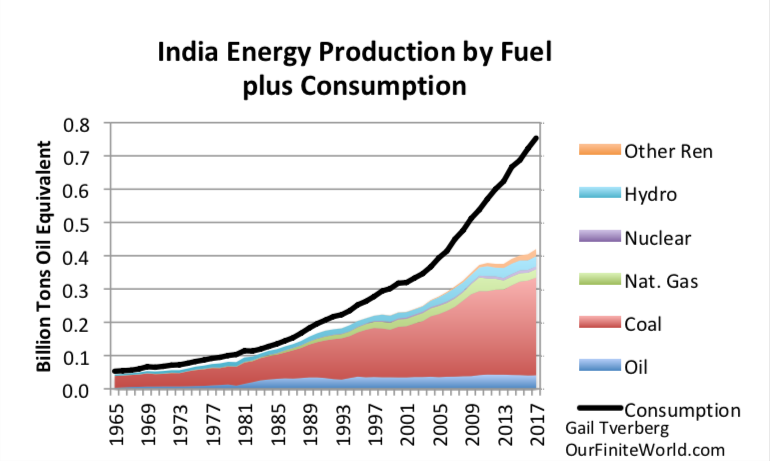 India's energy production by fuel, together with its total energy consumption, based upon BP Statistical Review of World Energy 2018 data. India's electricity sector seems to be having major problems recently. The Financial Times reports, “The power sector is at the heart of a wave of corporate defaults that threatens to cripple the financial sector.” While higher coal prices were good for coal producers and helped enable coal imports, the resulting electricity is more expensive than many customers can afford. The reason for using the R/P ratios is the fact that geologists, including the famous M. King Hubbert, have looked at future energy production based on reserves in a particular area. Thus, geologists seem to depend upon reserve data for their calculations. Why shouldn't a similar technique work in the aggregate? For one thing, geologists are looking at particular fields where conditions seem to be right for extraction. They can safely assume that (a) the prices will be high enough, (b) there will be adequate investment capital available and (c) other conditions will be right, including political stability and pollution issues. 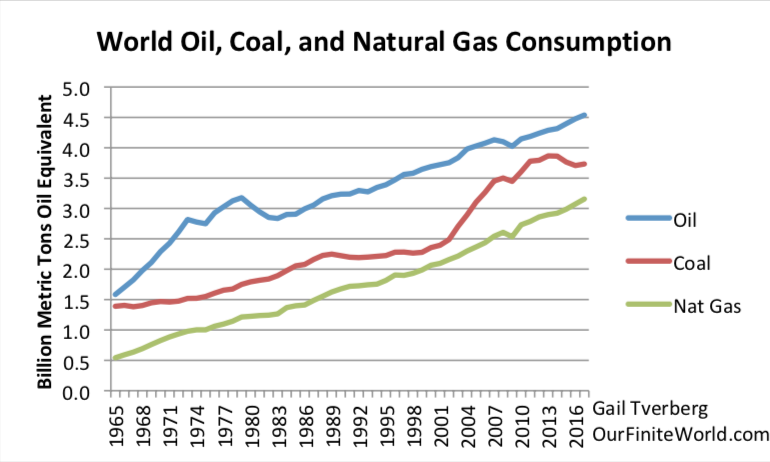 If we are looking at the situation more generally, the reasons why fossil fuels are not extracted from the ground seem to revolve around (a), (b) and (c), rather than not having enough fossil fuels in the ground. Let's look at a couple of examples. China's coal production dropped in Figure 4 because low prices made coal extraction unprofitable in some fields. There is no hint of that issue in China's reported R/P ratio for coal of 39. Although not as dramatic, Figure 4 also shows that China's oil production has dropped in recent years, during a period when prices have been relatively low. China's R/P ratio for oil is 18, so it theoretically should have plenty of oil available. China figured out that in some cases, it could import oil more cheaply than it could produce it themselves. As a result, its production has dropped. In Figure 7, India's coal production is not rising as rapidly as needed to keep production up. Its R/P ratio for coal is 137. Its oil production has been declining since 2012. Its R/P for oil is shown to be 14.4 years. Figure 8. Venezuela's oil production, consumption and exports, based on data of BP Statistical Review of World Energy 2018. Yet Venezuela reports the highest “Proved oil reserves” in the world. Its reported R/P ratio is 394. In fact, its proved reserves increased during 2017, despite its very poor production results. Part of the problem is that proved oil reserves are often not audited amounts, so that proved reserves can be as high as an exporting country wants to make them. Another part of the problem is that price is extremely important in determining which reserves can be extracted and which cannot. Clearly, Venezuela needs much higher prices than have been available recently to make it possible to extract its reserves. 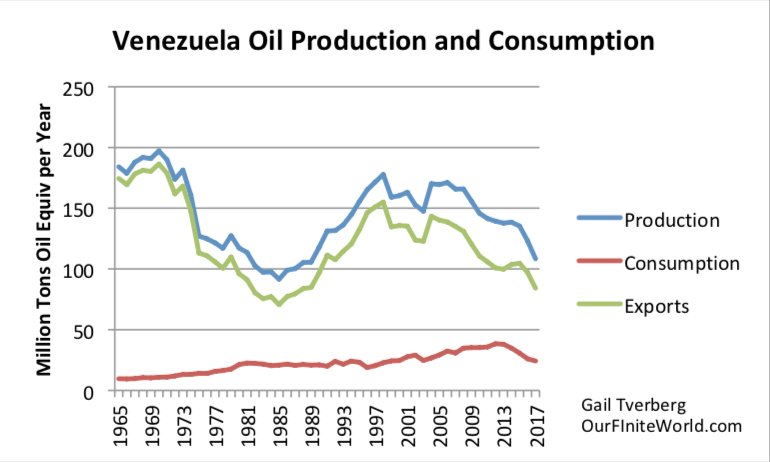 Venezuela also seems to have had low production in the 1980s when oil prices were low. In 2017, wind and solar together produced about 59% as much electricity as nuclear power, on a worldwide basis. 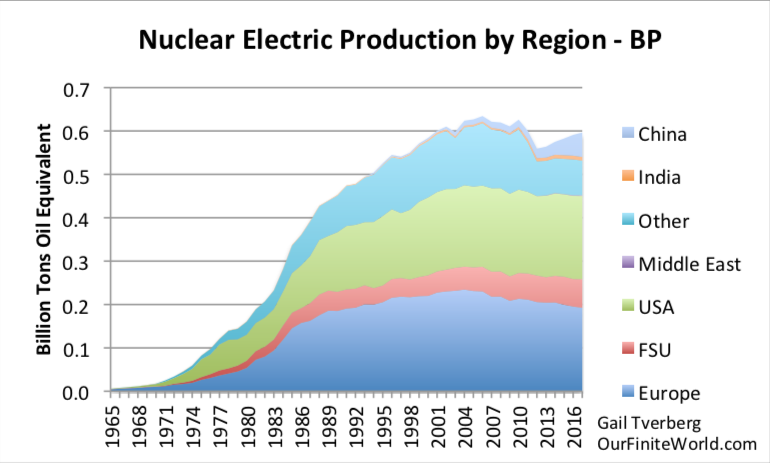 It would take a major effort simply to replace nuclear with wind and solar. The results would not provide as stable an output level as is currently available, either. (1) There is more than one way of seeing see that energy consumption per capita needs to rise, despite rising efficiency. (a) Diminishing returns ensures that an increasing share of energy supplies must be used to dig deeper wells or provide water desalination, to operate mines for all kinds of minerals, and to extract fossil fuels. This means that less of what energy that is available that can get back to workers. (b) Governments need to grow because of promises that they have made to citizens. Retirement benefits are particularly an issue, as populations age. This takes another “cut” out of what is available. (c) Increased use of technology tends to produce a much more hierarchical structure of the workforce. People at the top of the organization are paid significantly more than those near the bottom. Globalization tends to add to this effect. It is the low wages of those at the bottom of the hierarchy that becomes a problem because those workers cannot afford to buy the goods and services that they need to provide for themselves and their family. (d) Increasing use of technology can often produce replacements for manual labor. For example, robots and computers can replace some jobs, leaving many would-be workers unemployed. The companies that produce the replacements for manual labor are often international companies that are difficult to tax. Governments can try to raise taxes to provide benefits to those left out by the economy because of the growing use of technology, but this simply exacerbates the problem described as (b) above. (e) The world economy always has some countries that are doing better in terms of GDP growth than other countries. These countries are nearly always countries whose energy use per capita is growing. Current examples include China and India. 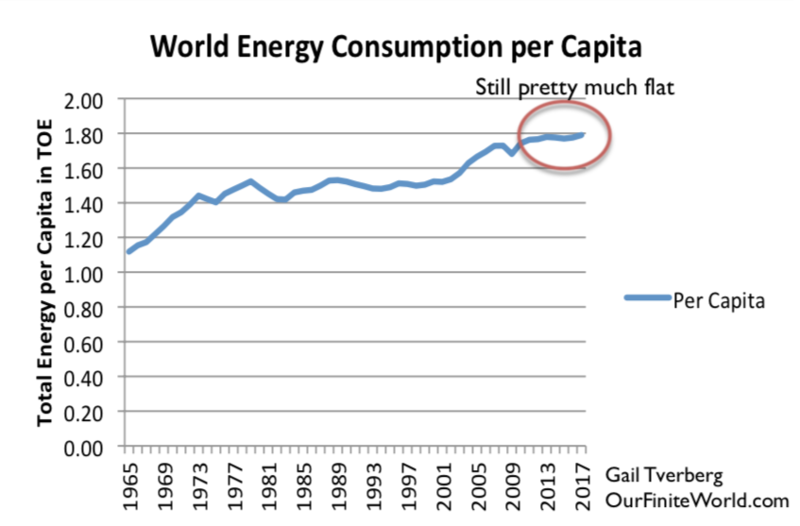 If world resources per capita are flat, there must be other countries whose energy consumption per capita is falling. Examples today would include Venezuela, Greece and the UK. It is the countries with falling energy consumption per capita that have the more severe difficulties. Our networked world economy cannot get along without these failing economies. Besides the issue of enough goods and services getting back to those with limited skills, a second basic issue is having enough energy-based goods and services to actually fulfill promises that have been made. One type of promise is debt and related interest payments. Another type of promise is that made by pension plans, whether government sponsored or available from private industry. A third type of promise is represented by asset prices available in the market place, such as prices of shares of stock and real estate prices.